On Saturday afternoon units from Solomons VFD and the medic unit were alerted for a subject that had just jumped from the Thomas Johnson Bridge and landed in the parking lot below. Units from Solomons (Sqd 3 and A37) arrived within minute of dispatch and requested MSP aviation for a pri-1 CAT A patient. Crews began to package the patient under the bridge, Chief10 who was in the area arrived on scene as the 1st ALS unit, soon followed by Chief 10C (Sturmer). Medics and BLS providers worked together to package the patient and asses all his injuries. As units were about to leave for the LZ SYSCOM advised the "Troopers" were cancelling the flight due to weather. A37 along with Chief 10C handled the ground transport to PG trauma. 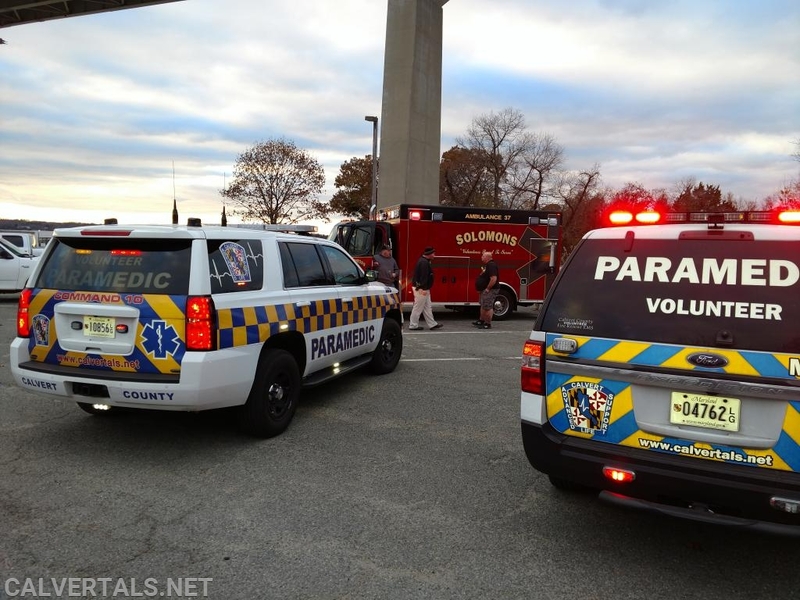 Subject Jumped from the Thomas Johnson Bridge in Solomons this afternoon. Units on scene under the Thomas Johnson Bridge.